By Alexis Leon and Mathews Leon,Vijay Nicole-Tata McGraw-Hill GTU Series, 2011. 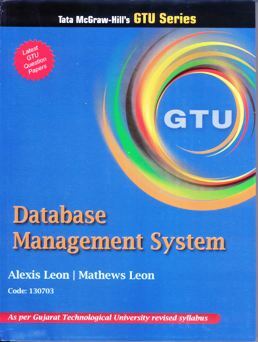 This book on Database Management System is designed as per the latest syllabus of Gujarat Technological University. The book has distinct emphasis on Relational Database Management Systems, Entity-Relationship Modeling, Normalization, and Structured Query Language(SQL). Written in a clear and easy-to-understand style, the book is content and pedagogy rich.